Obtain 25 Leystone Ore and a Suramarian Sapphire. Lately I've been working with the ore of this land, leystone it's called. I've found its qualities to hold remarkable strength and durability. We'll need a lot of it for this. There is felslate, but that's a probably too tainted for what you're looking to do with this barding. You know, I also like to adorn my pieces with something sparkly, like a jewel. 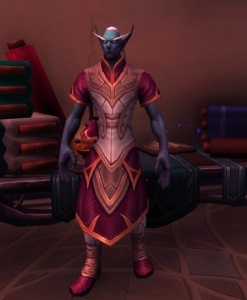 I've heard that the elves of Suramar have particularly beautiful ones. Perhaps you could acquire one for this project. I doubt you'll have a problem getting the leystone, but the sapphire might be a bit harder to acquire. You got them! Now to upgrade your barding. Never say a blacksmith can't improve on a leatherworker's work, I always say. I mean never. I mean... well you know what I mean.